Dillon and Jack with Bill Samuels Jr. of Maker's Mark! 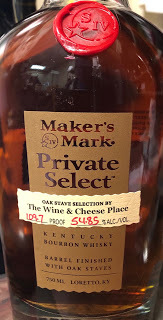 Dillon, our whiskey expert, from our Ballwin location went down to Maker's Mark to choose our 2nd Private Select barrel! We will not see the barrel until early 2019 though. Be patient, it is aging comfortably. When you visit the Maker’s Mark Distillery, you’ll have a rare opportunity to experience Maker’s Mark Private Select, a series of Maker's Mark expressions created by using the same principles Bill Samuels, Jr., used when he created Maker’s 46. Beginning as fully matured Maker’s Mark at cask strength, expressions of Private Select are created by adding 10 custom finishing staves to each barrel and finishing them in our limestone cellar to extract more flavor. The 10 finishing staves can be any combination of five flavor profiles chosen especially for this program. With 1,001 possible stave combinations, each expression of Private Select has a customized finish and taste profile that is unique, yet undeniably Maker's. Here is the description of the staves. Each stave is different oak and different toasting methods and degrees.